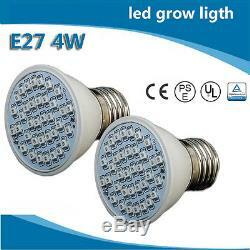 E27 LED Grow Light Full Spectrum Lamp Bulbs for Flower Hydro Plants Growing. 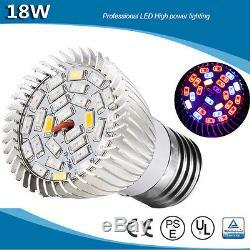 Item: 18W E27 LED Grow Light. 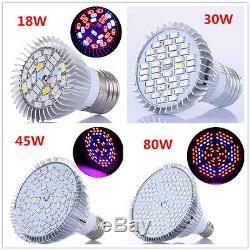 Input voltage: AC85V-265V Beam angle: 180 degree Light source: 28pcs SMD 5730 Chips Body temperature: <60°C LED working temperature: <65°C Source life: > 50,000 hours Light color: 15. Full spectrum Red(620-630nm;650-660nm); Blue(440-450nm;450-460nm); IR(730nm); White(3500K;6000K) UV(380nm). 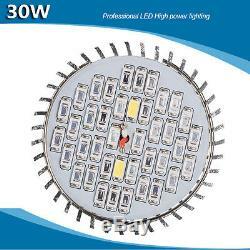 Item: 30W E27 LED Grow Light. Input voltage: AC85V-265V Beam angle: 180 degree Light source: 40pcs SMD 5730 Chips Body temperature: <60°C LED working temperature: <65°C Source life: > 50,000 hours. 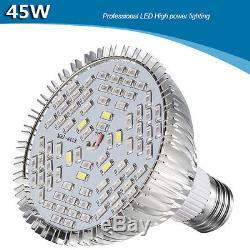 Item: 45W E27 LED Grow Light. Input voltage: AC85V-265V Beam angle: 180 degree Light source: 78pcs SMD 5730 Chips Body temperature: <60°C LED working temperature: <65°C Source life: > 50,000 hours Light color. 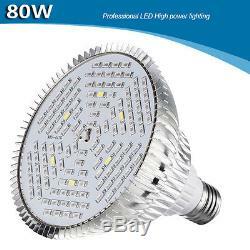 Item: 80W E27 LED Grow Light. 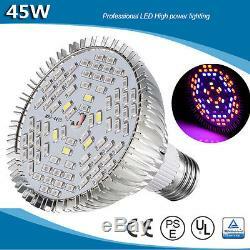 Input voltage: AC85V-265V Beam angle: 180 degree Light source: 120pcs SMD 5730 Chips Body temperature: <60°C LED working temperature: <65°C Source life: > 50,000 hours Light color. Color Ratio: Red(620-630nm;650-660nm); Blue(440-450nm;450-460nm). 1pc E27 LED Grow Light. Energy Electricity Saving with Higher-level Efficiency. 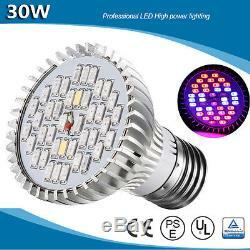 1W LED can replace 3.5W HPS, HID, MH, Incandescent & Halogen Lamp. Is accelerating leaf growing and plants grow. Is the key to promote flowering and plants grow. Function: sterilization, kill bacteria which seriously influence plants flowering & growing. Function: promoting cell division and flowering & veg, increase yield in a certain degree. Perfect for small Grow Box, Grow Tent, DIY Hydroponics, Bonsai, Garden... Etc Comfortable, Humanistic & High-performing. 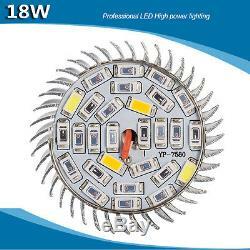 This greenhouse light can cover more kinds of plants which need stronger lights, also better for flower and fruits period because of more red wavelength. This hydroponic led grow light can rapidly improve the health of plant and growing, generally more leaves popping up within 2 weeks of using this growing lamp on a daily basis. This led light for plants growing is designed to fit standard E27 socket, Easy to set up and use - no special lamp needed, a desk lamp will do. 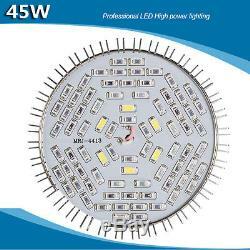 LEDS has low power consumption, high luminous efficiency and long service life, the electronics inside are stepping down the voltage. The outside is constructed in a pure heat-sink fashion, It does not generate any noticeable heat even 17hrs a day. Keeping your temperatures down perfectly. Blue(wavelength: 430nm, 460nm): Help plants grow Red(wavelength: 630nm 660nm): Help plants grow and flowering , red LED is the key for flowering plants IR(wavelength: 730nm): IR can help plants grow, we add 1 or 2 piece IR LEDs If you really need it in a specific situation for full spectrum. UV(wavelength: 380nm): UV can help plants grow and kill insects , we made special design and add UV & IR LEDs for your need. More similar to sunshine, better for your plants growing. 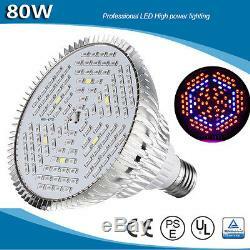 The item "New 18/30/45/80W LED Grow Light E27 Lamp Bulb for Plant Hydroponic Full Spectrum" is in sale since Wednesday, April 20, 2016. This item is in the category "Home & Garden\Yard, Garden & Outdoor Living\Gardening Supplies\Hydroponics & Seed Starting\Grow Light Kits". The seller is "superfavor1949" and is located in China. This item can be shipped worldwide.